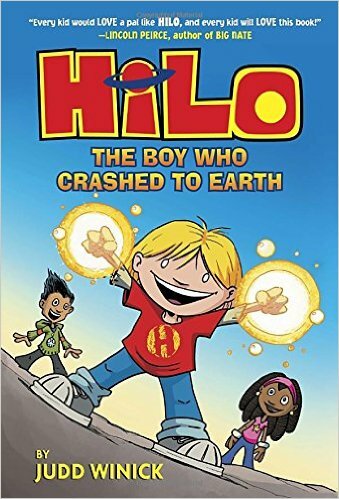 According to the press materials for Hilo: The Boy Who Crashed to Earth, series creator Judd Winick set out to create a genuinely kid-friendly superhero comic. School librarians rejoice: the end result is perfect for your 9-year-old reluctant readers (even the ones with super-conservative parents). 10-year-old D.J. Lim has always thought of himself as the odd man out, but “odd” takes on a whole new meaning when he meets Hilo, an alien robot boy with boundless curiosity, a sunny nature, and no memory. Along with D.J. 's friend Gina, the trio sets out to discover how Hilo ended up on Earth—and why he keeps getting attacked by giant robotic bugs. From a critical standpoint, it would be easier to write about Hilo if it wasn't so thoroughly inoffensive, but Winick dials up the “wholesome” setting to 11. His diverse cast of characters is sweet and loyal, his villains are clearly capital-E Evil (we can all disapprove of planet-destroying mutant bugs, right? ), and his story features enough quirky charm to keep it from feeling completely vanilla. Hilo really isn't aimed at adult readers, but I'm betting there are loads of kids out there who will absolutely love it. Review based on publisher-provided copy.